Dr. Michael D. Martin, conductor of the Symphonic Band, holds degrees from Youngstown (Ohio) State University, and a Ph.D. in Music Education from Kent (Ohio) State University. He has been here at Albany State University since 1999, and also has ten years experience as a school band director in Pennsylvania and West Virginia. He has publications with TRN Music Publishers as well as articles in the Journal of Band Research and the Journal of Historical Research in Music Education. 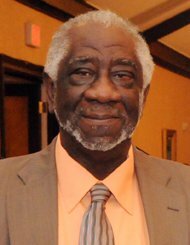 Albany State University suffered a great loss with the death of Jesse L. Walker, assistant professor of music. Walker was a conductor of ASU’s Concert Band as well as director of Low Brass and Strings Studies. He died at Phoebe Putney Memorial Hospital due to illness. He earned a bachelor’s degree in instrumental music education from Florida A&M University. Walker went on to earn a master’s degree in music education from Georgia State University at ASU, and an educational specialist degree in music education from Troy University. He also studied music education and conducting at Vandercook College of Music in Chicago, with further studies at Boston University. Walker was a Hall of Fame member of the Phi Beta Mu International Bandmasters Fraternity. He was also a member of the Kappa Kappa Psi band fraternity, Phi Mu Alpha Sinfonia, International Society of Bassists, the International Trombone Association, and the International Tuba/Euphonium Association. Walker was the recipient of the Bandworld Legion of Honor Award and the John Philip Sousa Foundation Legion of Merit.